The Artist Invoice Template gives those that sell their art a useful yet straightforward means to charge for paintings, prints, sculptures, digital art, or anything else that an Artist decides to sell. To further simplify the invoice, the PDF and Excel versions calculate all amounts and totals, leaving the Artist to focus more on the things that matter most. Because the invoice is designed for non-immediate payment, the seller may set the required amount of time before payment to roughly match shipping times, or to give a chance for the buyer to determine if he or she wants to keep the purchased piece of art. Before you can issue an invoice, you’ll need to give your artwork a price. An important fact to remember is that there’s no “correct” price – art is worth what someone will pay for it. While you shouldn’t use that saying to charge a ridiculously high price in hopes that someone will bite, at the same time, you shouldn’t devalue your art because of your emotions either. Base your art off of other’s work – Regardless of whether you are selling paintings, sculptures, photographs, or drawings, looking at what artists similar to yourself charge for their work will give you a great starting point. Use a sizing formula – For things like paintings, the artist can use the common formula “Square Inch X Dollar Amount” to price their different sized paintings. However, the question you still have to ask is, “What dollar amount”? Be confident – When discussing pricing with a potential customer, stand by the price you set. Although you may not realize it, buyers can sense any unconfidence and will take advantage of that fact in any way possible. Be straightforward with your pricing – Just like unconfidence, customers can sense if you being shady with your price, such as offering higher or lower prices depending on your perceived wealth of the customer. If you keep in mind the above points, you will be well on your way to formulating a fair and accurate price! Below is a brief guide on completing the invoice in our PDF and Word formats. Download the Artist Invoice in either Adobe PDF or Microsoft Word. In the header area, enter the studio or artist’s name followed by the artist’s contact information to the right. Next, enter the items sold to the client. Start with how many of each item, the item # (if applicable), a brief item description, and finally the price per item. The PDF version will find the ‘Amount’ value automatically. 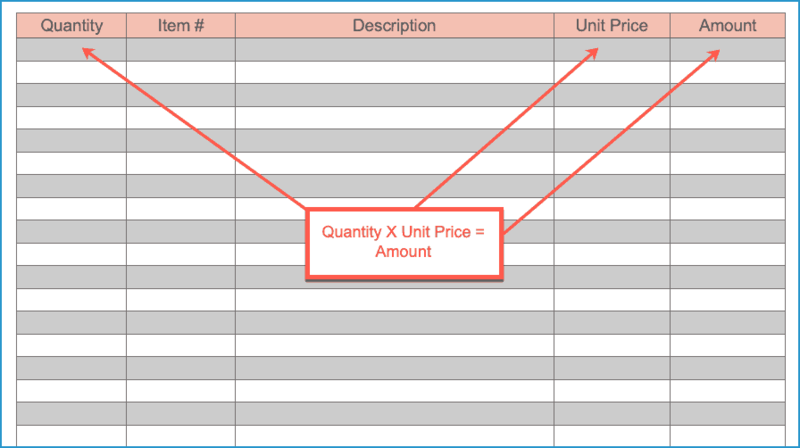 If using the Word version, multiply the quantity by the item price for each row. Enter any Sales Tax and add to the Subtotal to find the Total invoice amount. In the bottom header area, enter any comments for the buyer of your art such as an address to send the check, or a personal thank you. Finish the invoice by entering the number of days the buyer has to pay the invoice by.